Early results of using so-called snorkel cages to farm salmon show that the number of lice found on fish has been reduced by 80%. This has led to the need for only half as many lice treatments in the snorkel cages, according to researchers trialling the technology in Norway. 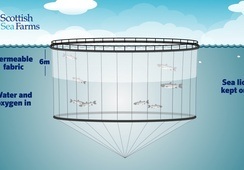 The main difference between a standard cage and a snorkel cage is that the snorkel cage has an extra net ‘ceiling’ that prevents the fish from swimming in the surface water. 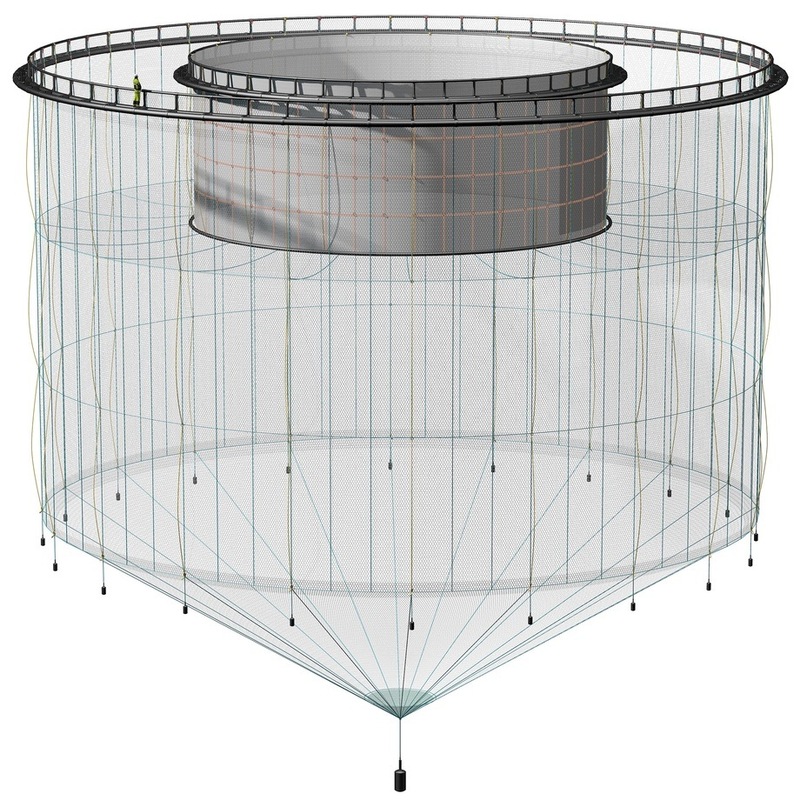 Because salmon need access to air to fill their swim bladders, the cage contains a ‘snorkel’ or tube in the net ceiling leading up to the surface (see figure 1), explains an article on the Institute of Marine Research (Havforskningsinstituttet) website. The snorkel allows the salmon to access air despite the ceiling. Figure 1. Illustration of a snorkel cage. The snorkel itself comes up inside the inner ring. The net ceiling which prevents the fish from swimming in the surface layer is seen down at the depth where the inner ring starts. The depth of the ceiling can be varied. In the period immediately after hatching, the small lice larvae are usually around the top water layer, mostly from 0 to 10 metres deep. "In this phase, the salmon lice spread to new hosts of either salmon, rainbow trout or sea trout," said Daniel Wright, who is a researcher at the Institute of Marine Research, and works as a supervisor in the R&D project testing the snorkel cages on a commercial scale. 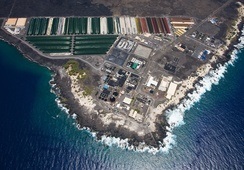 "In standard cages, the salmon have the opportunity to stay in the top water layer. The lice have good opportunities to meet and then stick to the salmon. 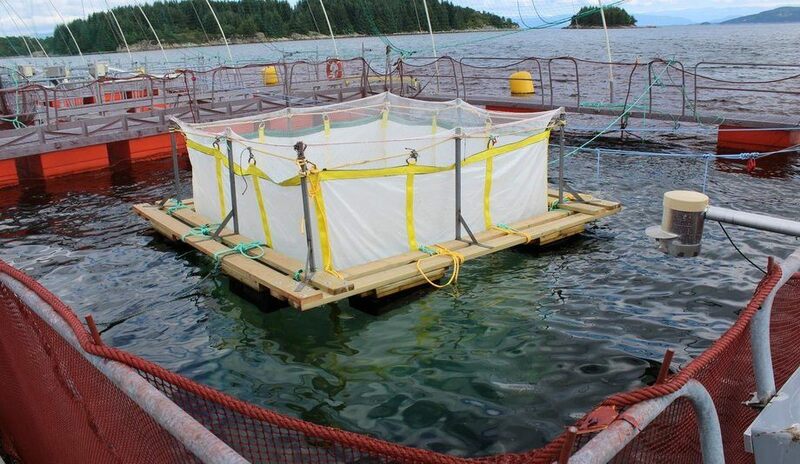 However, the net ceiling in the snorkel cage largely obstructs lice from meeting the salmon, since the salmon are forced to stay deeper than 10 metres,” explains Wright. Wright and his colleagues found that the incidence of salmon lice reduces as snorkel depth increases and that there were almost no lice at 16 metres deep, while the salmon seemed happy. "It's much smarter to prevent the fish from getting lice in the first place than treating lice that have already settled on the salmon," Wright says. Testing of snorkel cages has previously only been done on a pilot scale. "Then we saw that the fish had fewer lice in the snorkel cages, so we are now testing the method in commercial fish farms," Wright said. 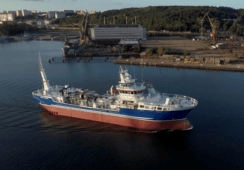 Since 2016 Wright and his colleagues have used three standard cages and three snorkel cages at the Låva site at Bremnes Seashore AS to test the effect of the new cage technology on lice and overall production performance through a full production cycle of salmon. "So far, lice counts every other week have shown that sessile salmon lice (ie "youth stages" of the lice) have been reduced by 80% in snorkel cages compared to normal cages," says Lena Geitung, at Bremnes Seashore AS. The number of treatments against salmon lice was the same for both types of cage through 2016 (Slice and hydrogen peroxide treatment to treat lice and amoebic gill disease). By 2017, however, snorkel technology has resulted in 50% fewer treatments for salmon lice (Thermolicer and hydrogen peroxide treatment). 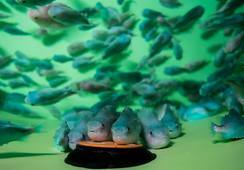 The amount of cleaner fish has been the same for both types of cage and has comprised several species. "However, there are still some challenges to get the cleaner fish to be effective in the snorkel cages," says Geitung, who will optimise the use of cleaner fish in her next commercial trial. Figure 2. Temperature, salinity (both as depth functions) and average number of sessile salmon lice per fish throughout the experiment. Click to expand image. The number of salmon lice in the water is affected by the temperature and salinity of the water, which varies throughout the year. Thus, the risk of the spread of salmon lice on salmon also varies throughout the year. 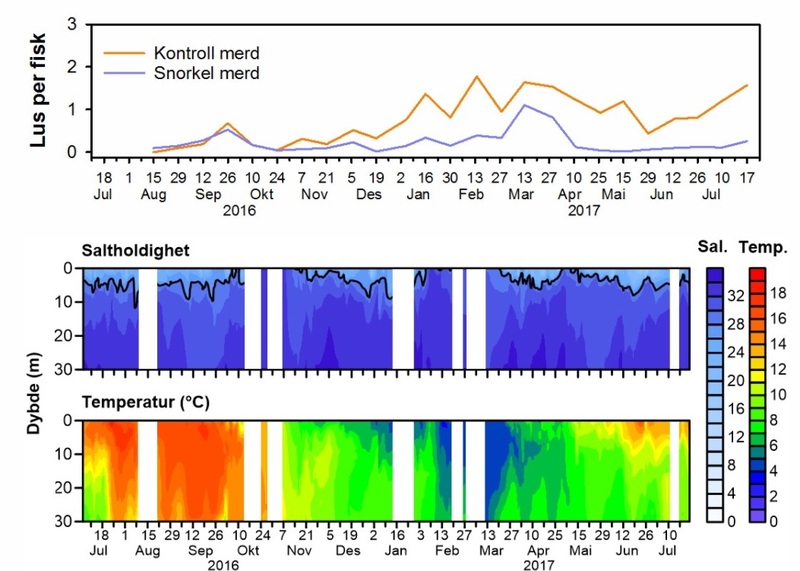 Figure 2 shows how temperature and salinity vary throughout the year, along with the counts of the sessile stages of salmon lice in standard and snorkel cages. 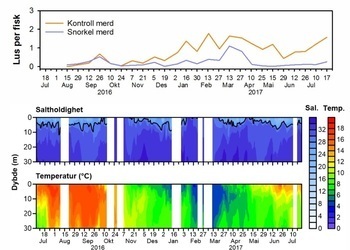 The snorkel cage technology has been developed in a collaboration between the Institute of Marine Research, University of Melbourne and Egersund Net. 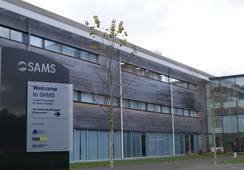 The technology is now being used and further developed with Bremnes Seashore AS, and the latest results come from its fish farms.